SHOP THE SPRING SUPER SALE! 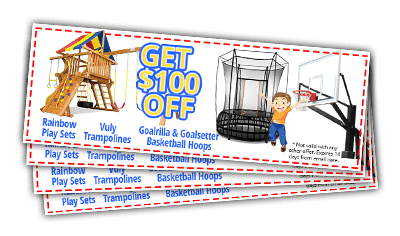 Swings-n-things is Cincinnati's Exclusive dealer for America's top brands including Rainbow Playsets, Goalrilla & Goalsetter basketball hoops, and Vuly Trampolines. Our brands offer unparalleled craftsmanship that cannot be matched by imitators. Rainbow Playsets are crafted from high-quality cedar and backed with a lifetime warranty! Bring your backyard to life with a swingset that is built to last. Vuly Trampolines rigorously combine safety, strength, form, and functionality. Run Jump-n-Play/Swings-n-Things is happy to offer Vuly Thunder and Vuly Lifts as part of our backyard lineup. Goalrilla Hoops are designed for a superior game experience. Goalrilla experts carefully designed their backboards to provide authentic rebound action. Step up your game with better rebounds! When something is American made you can be assured it's built with integrity and grit. Goalsetter Hoops have a few features that allow it to stand alone in the industry. 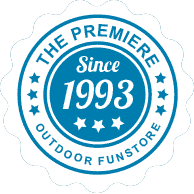 Run Jump-n-Play/Swings-n-Things in Cincinnati, Ohio cares about the health and safety of your family and offers only the top brands in our huge backyard recreation showroom. Run Jump-n-Play/Swings-n-Things is proud to be the only Rainbow Play Set dealer in Southern Ohio, Northern Kentucky, Eastern Indiana, and Western Virginia.